It was the night my journey with Nanny began! Actor/writer and everything in between Ruben Santiago-Hudson’s ode to Miss Rachel, or Nanny as she was affectionately known, the woman who helped raised him in her rooming house is moving and heartwarming. Santiago-Hudson grew up with the stern, but always available for a good turn-up, Nanny and was introduced to many renters who helped shape the boy into the fine man he would become. Unlike the 2005 television version, former “Law & Order” alum S. Epatha Merkerson who played Nanny won the Golden Globe for Best Actress, a Screen Actor’s Guild and Emmy Award in 2006, the stage version is Santiago-Hudson alone, the stage version is Santiago-Hudson alone, except for Grammy-award winning blues guitarist and composer Chris Thomas King accompanying him. Santiago-Hudson shows off his musical skills making that harmonica wail. The little boy meets his neighbors forever changing his life. It all begins in Lackawanna, New York where young Ruben’s mother brings him to their new home. His mother and father weren’t exactly parents of the year, often leaving the child in the custody of Miss Rachel. Soon, young Ruben would treat the boarding owner as his mother and she reciprocated the sincere sentiment. 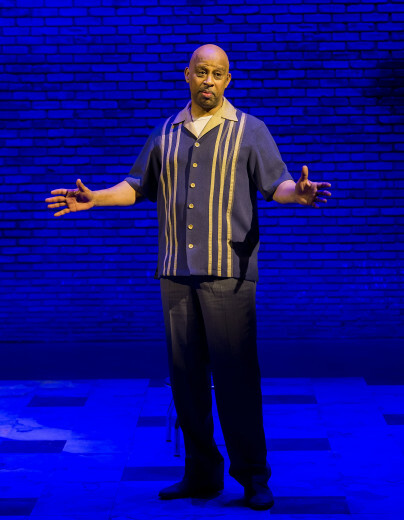 The stage version is a one man show where Santiago-Hudson brings out the bright personalities about over 20 characters either living in the house or strangers passing through. Miss Rachel helped everyone she could by providing shelter, food, a doctor or money to help them get by and get on to a better way of living. She wasn’t afraid of anything or anyone and when she stood her ground, others either stood next to her or left quickly. The cast of characters include Norma and her children running away from an abusive husband who happens to be a former boxer champion. He used Norma has a punching bag where the kids helplessly could only watch. How low! Then there’s Bill. Nanny’s much younger husband who likes to step out on Nanny way too many times. Believe when I say, she lets him have it good. Through the good times and the rough, young Ruben grows up to be a good man. A man that would make Nanny proud. King’s playing brings out the guttural, deep enriched sounds. You can snap your fingers, tap your feet or even dust the dirt off your shoulder in sync to perfect harmony with King’s guitar licks. Like the actor, the music embodies the show providing more insight of the characters. Hudson-Santiago keeps his energy up in the nearly 2 hour show, smiling, reminiscing and having a great time doing dance moves, y’all remember The Dog? he does and does it well. 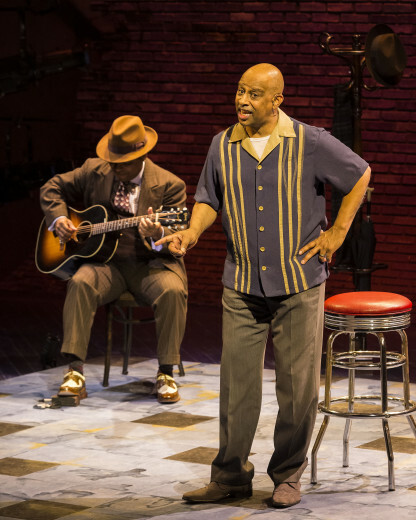 Lackawanna Blues plays Friday, March 29th at 8 p.m., Saturday, March 30th at 2:30 p.m. and 8 p.m., Tuesday- Friday (4/2 through 4/5,) at 8 p.m., Saturday April 6th at 2:30 and 8 p.m., Sunday April 7th at 1, Tuesday – Friday (4/9 through 4/12) at 8 p.m., Saturday, April 13th at 2:30 p.m. and 8 p.m., Sunday, April 14th at 6:30 and Wednesday, April 17th at 8 p.m. at the Mark Taper Forum, located at 135 N Grand Ave, in Los Angeles. For tickets, call 213.628.2772.